It was a recipe for dark chocolate truffles spiked with Grand Marnier that got Elisabet Der Nederlanden interested in boozy baking. The food stylist and professional recipe developer loved the contrast of creamy, bittersweet chocolate with bright citrus, and she’s since developed dozens of recipes using beer, wine and spirits. 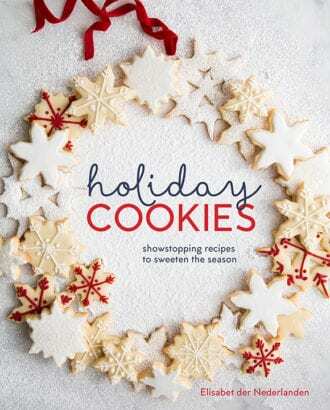 In her new cookbook, Holiday Cookies, recipes incorporate everything from matcha tea in chocolate bark to bourbon in chocolate truffles, and here, she shares some tips for making the most of boozy baking this season. Most kinds of spirits, beer and wine will work when added to cakes and cookies, but to make sure the results are favorable to you and yours, avoid playing with unfamiliar ingredients or brands. It might seem obvious, but it’ll be hard to determine what other ingredients will make for a good flavor match if you’re working with something foreign. Baking with your favorite beer, wine or spirit will also ensure that the leftovers don’t go to waste. A splash of vodka instead of ice water in pie crust recipes will help make the pastry nice and flaky, but in many cases, adding too much booze will also change the chemistry of a recipe in a negative way. Certain confections might not bake properly if too much alcohol is present, so following measurements is crucial. “A cake can benefit greatly with some booze inside, giving a tender crumb as well as resulting in a moist cake, but if there’s too much, the consistency will change, not baking as well and tasting more boozy then you probably want,” der Nederlanden says. When you’re ready to move beyond the written recipe, making your own extract is one way to work booze into the equation. Start with the neutral canvas of vodka, which Der Nederlander likes for both baking and cooking. “It has a sharp and bright flavor and adds a touch of heat that helps balance out the sweetness in a recipe.” If you want a deeper, richer flavor, swap in bourbon or aged rum. And if you don’t want to make the extract from scratch you can simply swap out the same amount of booze for extract in a recipe and achieve similar results. Soaking fruit in alcohol for several hours will also work booze into a fruitcake or cookie recipe without having to follow specific measurements. Or think beyond the baked good itself and consider what kind of boozy icing or sauce might complement an alcohol-free cookie or cake. “If you’re making a lemon cake, adding some limoncello to the simple syrup is a nice touch,” Der Nederlanden says. “Or adding Champagne or prosecco to the frosting of a strawberry cake, or Champagne to a white chocolate sauce would be lovely. It’s definitely worth experimenting, and once you get comfortable using booze in your recipes, you can take recipes to new levels.” Just be sure to start with a small amount and taste until you reach the desired strength. Homemade fig syrup adds an earthy-sweet nuance to the classic Margarita.